Power Regulator for Wiper Motor. Finally, a fantastic solution to the woes of having a 12V electrical system while maintaining your original wiper motor, semaphores, radio or any other component you may have in your early VW bug or bus. Exclusively made for Eddy and Dave's Garage, this apparatus hooks up in minutes and regulates the voltage going to your component. Different from a "volt-a-drop" or armature that maintains a certain voltage, this unit can have the voltage increase or decrease accordingly by the push of a button. Set between 5 and 8 volts, you can adjust your wiper motor, radio, or even semaphores to get the proper amount of voltage that works best. We have tested these units on all of the components listed and it worked flawlessly. Made in the U.S., this is a solid state component that can be affixed to any surface with its velcro attachment. 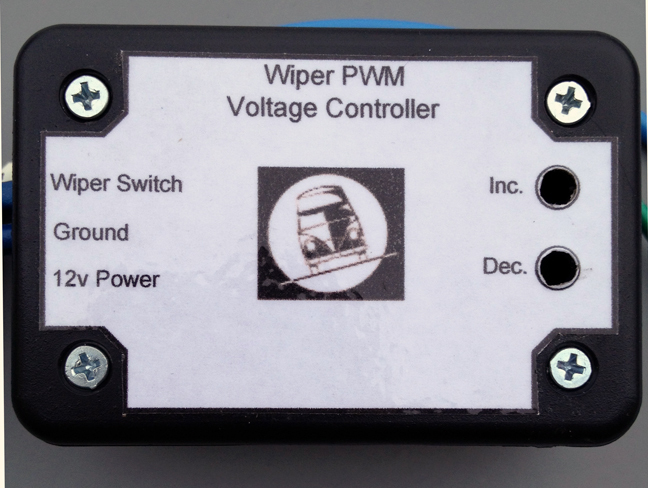 For wiper motors on busses, the unit can be hidden easily under the dash . For bugs, it can be placed under the hood. Free shipping within the U.S. for a very limited time. Click the button below to add the Wiper PWM to your wish list.